It was most encouraging to read the message to the nation by the re-elected Prime Minister Wickremesinghe, after a lengthy dialogue with President Sirisena. We commend your vision to build a new Sri Lanka in the coming 60 months, founded on the values of good governance and democracy, social justice, equality and accountability in what you hope would be a promise-keeping and not just promise-making era. In writing this we represent the largest minority of citizens of Sri Lanka (the physical and sensory ability restricted persons) – nearly 20% of the population. We appeal to you to help us help you build the ‘new’ Sri Lanka – a better Sri Lanka that will deliver on the promise of ‘equality’ and ‘social justice’. Irrespective of our positions and possessions, ability is an asset available only temporarily to all of us. None can continue with same abilities at all times. As such, world views and perceptions on what it means to be dis-abled have changed rapidly to focus on enhancing equally the quality of life for all people. Globally it is now recognised as a moral and economic duty to help make communities inclusive and liveable for everyone where everyday activities should not become a daunting task to accomplish. The growing emphasis world over is that citizens should never be marginalised by attitudinal, physical or architectural barriers. We also believe the time now is most appropriate to highlight some vital issues of national importance that we would like you to act on. Due to injuries after 30 years of armed conflict, accidents, ageing, numerous debilitating medical conditions or convalescing after surgery or illness, many people, for short periods or throughout their life, find their mobility, dexterity, sight, hearing or brain functioning restricted. But, sirs, it is not their impairments that find themselves fighting a silent uphill battle in daily life, but the social environment that renders people dis-abled. Hence, this trend is reversible in your able hands. The benches of the Supreme Court, in 2009 and in 2011, have unanimously agreed that near 20% of our population in this plight form the country’s biggest minority. Laws and regulations made in 2006 October and the Supreme Court Orders in April 2011 enshrined the principle of ‘accessibility for all’. Except for bits and pieces here and there, they are not implemented, promoting marginalisation. The right to enjoy access is also the single right on which enjoying several other rights depend heavily on. 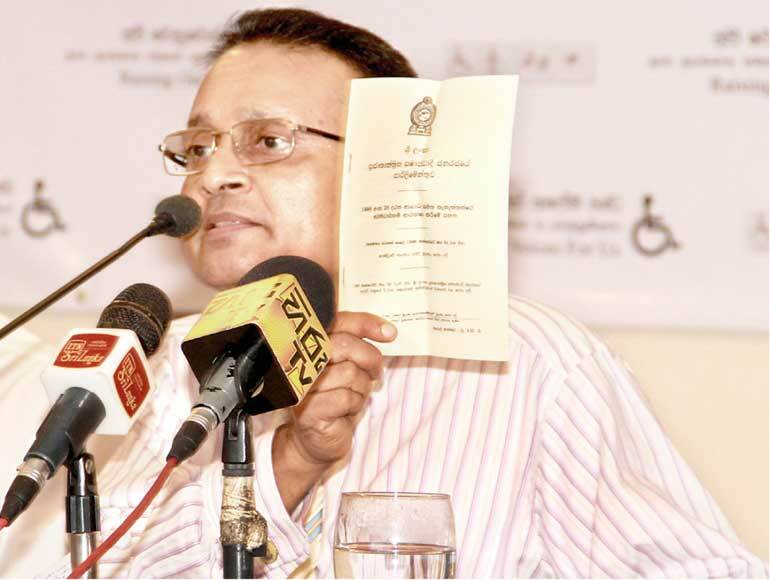 The dis-Ability Rights Bill (2010) that resolves key issues and the National policy of Sri Lanka on dis-Ability (2005) that affords equal opportunities within the socioeconomic mainstream, have yet to be enacted. A total of 152 countries, including Bangladesh, Mongolia and Vietnam, have ratified the 2007 signed UN Convention to promote, defend and reinforce the basic rights of this minority; Sri Lanka has not. We hoped that the elected politicians from several parties, with whom we have worked closely with, would make decisions for improving the quality of our lives. Even after 20 years, progress has been negligible. None of them has even spoken here in Parliament nor shown the desire to identify the root causes of our key issues. a) Children with limited mobility are often unable to access schools or universities or even ATM machines due to inaccessible and unsafe design facilities. Even Mahapola funded recipients are marginalised from benefiting. b) The gainfully employed such are often denied the opportunity to continue to work due to inaccessible work environments and prejudiced employers. They then become a burden on their families and the nation. c) None of the reputed hospitals has an accessible toilet in any ward for wheelchair users. d) In spite of the law, many government and private institutions, banks, hotels, restaurants, sports stadia, schools and places of recreation – toilets and washrooms in particular – remain inaccessible and/or a safety hazard often for the ambulant. e) Sri Lanka remains an unfriendly destination to a growing tourist sector, the global senior population of about 15%. The ‘accessible tourism’ sector is an untapped lucrative market mainly because of our poor infrastructure. f) ‘Sign’ language – the only mode of communication for our hearing impaired people – is not legally recognised nor promoted in Sri Lanka. g) Hand-held devices freely available overseas that bring improvement to the quality of life of those whose ability to see is poor are yet not available here. Certain laws due to the absence of any ‘exceptions’ clause – such as The Intellectual Property Law – further hinders their lives. h) For many of our heroic soldiers on retirement and also other victims of the 30-year conflict, now faced with various stages of restricted ability, life in civil society brings new sets of problems. We need to recognise and resolve these issues. 2. Constitutional protection still evades this largest minority. We proposed minor amendments to Article (12.3) of the Constitution, but found no politician to present this at the Parliament. Two pre-requisites to achieve a sustainable national economy are: (a). Arresting the waste of human potential and instead mobilising this asset and (b). Minimising unwanted dependency through increased opportunities. Political parties have belittled our cries for release of our innate potential. Instead of promoting equal opportunities for employment and education, we are made unwanted dependents on charity and social welfare beyond minimum. Although measures required to ‘Make Sri Lanka a truly dis-Abled friendly country’ – which will also boost our human rights image – are low cost and feasible, they yet to become a meaningful reality. With previous Parliamentarians indifferent to rights for this largest minority in Sri Lanka, we realised the need to obtain a voice in Parliament for the voiceless largest minority. We made many efforts to be included in the nominations of the mainstream political parties for the recent Parliamentary elections until 48 hours before nominations closed. But one found any of us from this largest minority – several academically and professionally qualified intellectuals with vast experience – eligible to fill a place in their national lists. We as a group of professionals then decided at very short notice to contest the August Parliamentary elections as independent candidates for the Colombo and Gampaha Districts. 1. None of us had previous experiences in contesting any elections. 2. All of us have restricted ability in our mobility or sensory abilities. 3. We just had only 30 days to attend to all matters. 4. Almost all radio and television stations indicated that airtime to take out our messages could be afforded only for those who had placed ‘paid advertisements with them’. Millions of rupees thus needed was beyond our individual means. We also were not able to get the justified intervention of the Elections Commissioner to direct these stations. Despite these limitations, in the Colombo District we came second amongst 15 Independent Groups and were placed 14th from 36 contestants. In the Gampaha District we faired most encouragingly emerging as the first Independent Group and were placed seventh from 28 contestants. This clearly demonstrated that emerging numbers of our citizens supported the rights of equality we are espousing. 1. We offer you unreservedly our expertise backed by long years of wide experience to work with you in bringing about ‘equality and social justice’ for the four million citizens with restricted ability. Help us help you in the drive for equality. 2. Activate the dormant legislation and set up the framework to ensure it is effectively implemented and followed as promised by you to strengthen the rule of law. Amongst the many other priorities the new Government is having, we believe in the larger interest of an inclusive better Sri Lanka, these are ‘practical and possible’. With our new leaders emphasising ‘Yahapalanaya’ (good governance), a just society and a ‘Pivithuru Hetak’ we are confident in this ‘promise-keeping’ era, you will soon heed our call. It is not an act of charity but an act of justice and, justice enriches us all.